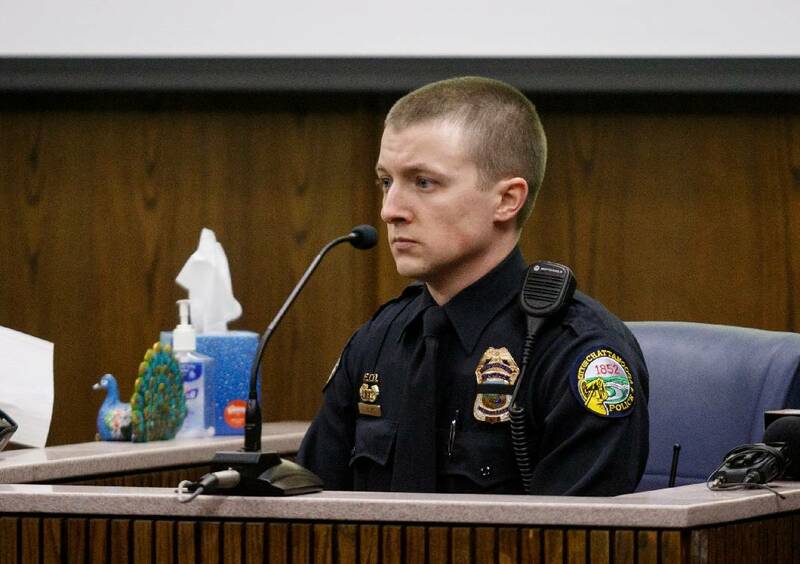 Officer Jarrod Justice, who was field training officer to Officer Nicholas Galinger, testifies during a preliminary hearing for Janet Hinds before Judge Alex McVeagh at the Hamilton County-Chattanooga Courts Building on Tuesday, March 5, 2019, in Chattanooga, Tenn. Judge McVeagh bound charges against Hinds in the Feb. 23 hit-and-run death of Galinger over to a grand jury. A state agency that oversees workplace safety is investigating the circumstances surrounding the crash that killed Chattanooga police Officer Nicholas Galinger in a February hit-and-run on Hamill Road. It will be the first Tennessee Occupational Safety and Health Administration investigation involving the Chattanooga Police Department in more than five years, according to an administration spokesman, who confirmed the investigation, and it's only the second in at least 10 years (a TOSHA investigation at the Chattanooga police firing range ended in early 2011), according to the agency's online records. The agency investigates many workplace fatalities but does not typically investigate police deaths unless they involve an officer killed while directing traffic or in a work zone. In those cases, TOSHA can choose to investigate the circumstances surrounding the event. TOSHA is required by law to complete the investigation within six months. Its investigation began Feb. 24, the day after the incident. "TOSHA does not release any preliminary information during the investigative process. The file will be open for public review once the investigation is closed," according to an email from administration spokesman Chris Cannon. Chattanooga police Officer Jarrod Justice, who was Galinger's field training officer, was the first to testify during a preliminary hearing Tuesday morning for 54-year-old Janet Hinds, the suspected driver who struck and killed Galinger. During the nearly four-hour hearing, an emotional Justice answered questions from both the prosecution and the defense describing the scene of the crash. He and Galinger, 38, traveled to the 2900 block of Hamill Road that night to respond to a call about an overflowing manhole cover. They only expected to be at the scene for a couple of minutes. They got out of their vehicles, talked and joked with one another, examined the scene and determined there wasn't much they could do. The two planned to report the incident to the city's Public Works department and move on with the rest of their shift, which had just begun, Justice testified. They never got the chance. As they walked back to their vehicle, Galinger turned around and walked back to the manhole cover. Justice testified he isn't sure why the new officer turned around, but regardless, Galinger walked back to the overflow and hunched over alongside the manhole cover, examining it with his flashlight. Galinger's father told the Times Free Press he believes his son was picking up a sign that had fallen into the roadway. Justice said he was was 10 or 20 feet away from Galinger when a car came speeding down the center of the road, driven by Hinds, who was allegedly going home after spending time at a Ringgold, Georgia, restaurant. Her receipt and security footage showed she drank 76 ounces of beer and one shot of vodka over the course of three-and-a-half hours. Investigators believe the white Honda CR-V she was driving was traveling between 47 and 52 miles per hour in a 35 mph zone. Justice began shouting Galinger's name to warn him, but the officer didn't hear and was struck, crashing into the windshield, over the roof and landing approximately 160 feet down the road, according to investigators. Justice quickly made an emergency call over his radio, moved his vehicle into the roadway and turned on the flashing blue lights to block traffic. He then began administering CPR on Galinger, he testified. Although officers typically carry reflective vests, Justice and Galinger weren't wearing them that night because they weren't directing traffic and only planned to be at the scene a short time. However, Galinger was wearing a rain jacket that may have had a reflective strip on it. The emergency lights also hadn't been turned on prior because Justice said they were worried they'd be a distraction to drivers and, again, they didn't plan to be there long. Chattanooga Police Department policy states that the siren and blue lights must be on when the vehicle is involved in an emergency operation, and it's generally up to officers to determine whether there is enough information to justify an emergency situation. Blue lights may be used to minimize a traffic hazard, according to policy. And when officers come across a roadway and roadside hazard, policy says they should take steps to eliminate the hazard if possible, or report it to the proper authorities. In this case, that would be Public Works, which Justice said he and Galinger planned to do. Those policies wouldn't apply in this situation because officers Galinger and Justice were not responding to an emergency and were not directing traffic. The police department does not have any open internal affairs investigations related to this incident. Public Works responded to overflows, flooding and other water-related issues all week and had been checking each site multiple times per day, according to agency spokesperson Colline Miller. The department was alerted to the overflow on Wednesday, February 20, but it wasn't a risk to drivers traveling on the road, according to Miller. Public works employees placed an EPA-mandated sign on the side of the road parallel to the manhole. The sign is required anytime there is an overflow. The city's signage alerted drivers to a sanitary sewer overflow and was attached to an a-framed structure with a light. Crews checked the overflowing manhole again the next day. Both the barricade and sign remained in the same location alongside the road, Miller wrote in an email that gave a timeline of Public Works work at the site. The day of the crash, a Public Works crew member was alerted to a missing lid on the manhole and went to inspect the scene. The lid was attached by a hinge and not missing but slightly off-center due to the "amount of water exiting the manhole," according to Miller. The crew slid the lid back into place and moved the a-frame barricade from the side of the road and placed it straddling the manhole lid. The light on the barricade wasn't working, according to a passerby who photographed the scene three minutes prior to the collision. By 11 p.m., the sign was also missing from the structure. "We are wondering the same exact thing," Miller said of the missing warning sign. "At some point during the evening, the sign was lost or moved or taken. We are unsure. We had crews out searching [Tuesday] but they haven't located it yet." Galinger was buried in Cincinnati on Friday. Hinds faces nine charges, including vehicular homicide, which are to be presented to the grand jury in the near future. Contact staff writer Rosana Hughes at rhughes@timesfreepress.com or 423-757-6327 with tips or story ideas. Follow her on Twitter @HughesRosana.